Editor’s Note: As is so often the case in the Second Amendment Friendship, one thing—or person— leads to another. Jim Irvine, who I had just seen at the NRA Annual Meetings in Atlanta, forwarded a story from the Buckeye Firearms Association (BFA) e-newsletter to my father, who forwarded it to me. 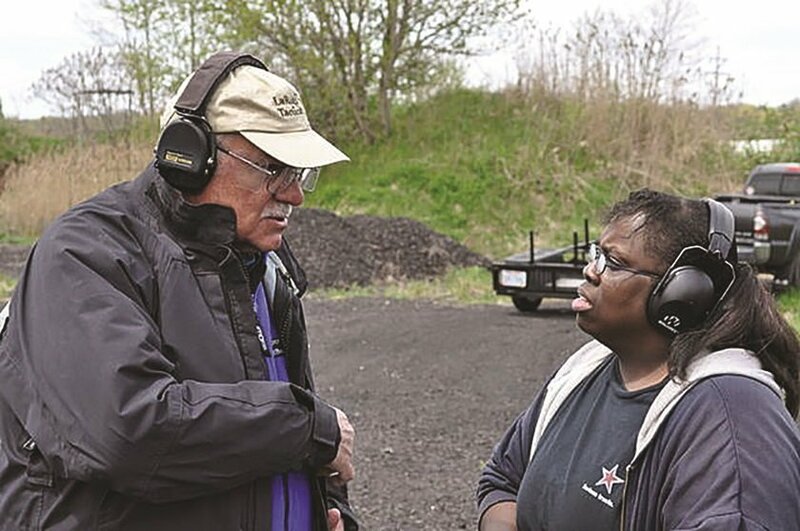 It was the first-person account of a student new to both the Buckeye Firearms Association and formal gun training and the enthusiasm and appreciation for the class was palpable in the written words. We reached out to Jim, and he set in motion emails between the author,Candy Petticord and fellow BFA member Joe Eaton who took the class pictures used here. I then corresponded with Joe about photos and with Candy about using the story in Women & Guns. Both were enthusiastic about doing so and Candy and I corresponded a bit about some other details. I was interested to learn what gun and holster she had taken to class and whether after doing so she changed any of her equipment.That information is presented here in italics to fill out Candy’s first person account more fully for W&G readers. Candy also sent along photos of her gun and holster. 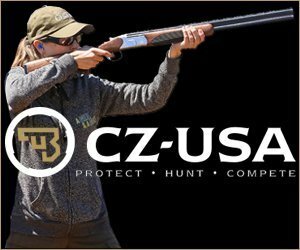 For more information on the Buckeye Firearms Association, their class schedules and their ground-breaking FASTER program for schools, visit their website at buckeyefirearms.org. Irvine let us know that Candy had signed up for additional classes with BFA. 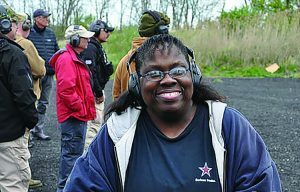 Please let me begin by admitting that I attended this class after completing my concealed carry (CCW) class and, at this point, I had had no other formal firearms training. 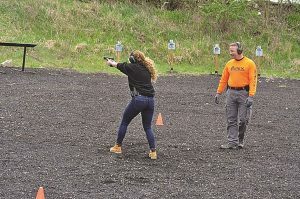 Although I understood the importance of practice with my gun, I had primarily completed private, unsupervised, target practice at an indoor range, which also meant that I had had no practice drawing from a holster, since that is not allowed at the range. After a number of months, stationary target practice was beginning to feel stale and boringly repetitious and I wanted to do something different. After reading a news article about a violent shooting in my neighborhood, I realized that even with all of my range practice, I was extremely ill-equipped and completely unprepared to properly use my gun were I to become engaged in one of those “deadly force encounters” that was repeatedly mentioned by instructor Dan Clevenger in my CCW class. Dan also highly emphasized that concealed carry training did not end with the acquisition of a CCW license—that was where the real training should begin and that weapon training and practice are lifetime, dynamic activities. As I mentioned, this is the first formal class that I attended since obtaining my CCW. I’ve been told that I am a fairly decent shot and, while that is encouraging to hear, I know that in a real-world situation, very few bad guys are going to just stand there patiently and wait for me to assume my stance, grip my gun correctly, acquire the proper sight alignment and proper sight picture, exert steady and proper pressure on the trigger, and execute proper follow through while attempting to blow his brains out, and all while making sure that I’m not hyperventilating or holding my breath while doing said attempt of blowing out a bad guy’s brains. 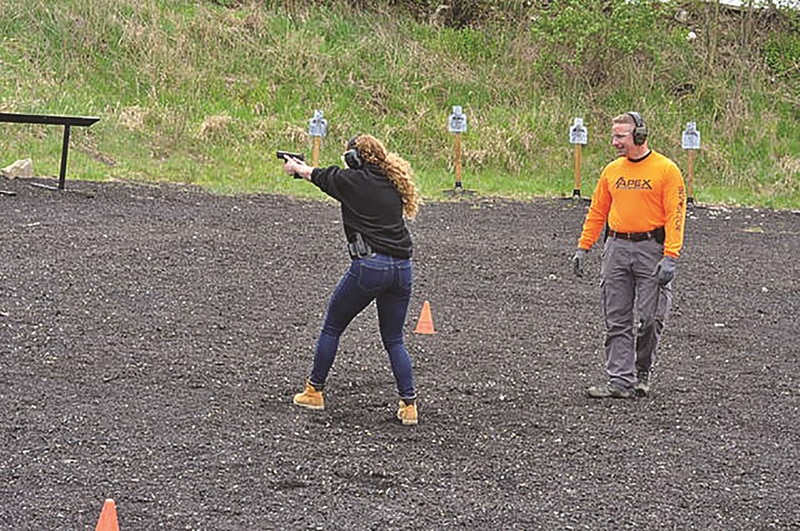 I knew that I needed more training, I knew that to be prepared for a self-defense situation I needed to learn how to move and shoot, and I knew that now was the time for me to take this next training step. 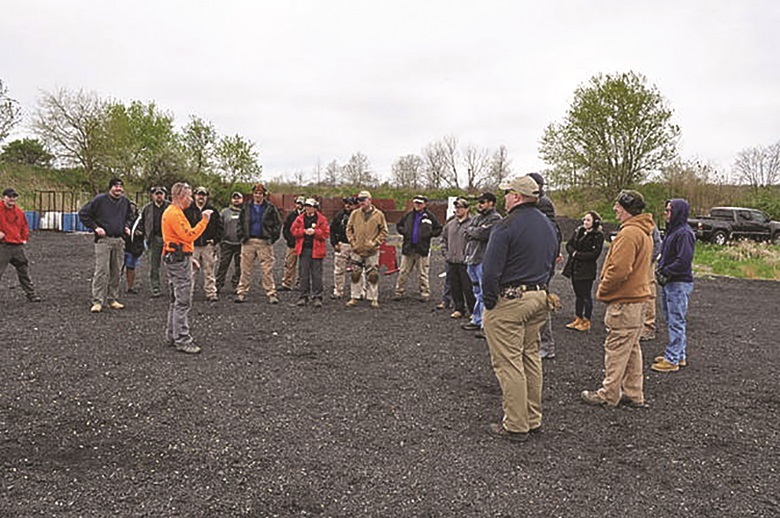 My CCW Instructor strongly encourages the members of his CCW classes to join two organizations: the National Rifle Association (NRA) and the Buckeye Firearms Association (BFA). I, being an obedient but financially challenged new CCW holder, immediately joined the organization with which I was most familiar, the NRA, as I had never really heard of the BFA. However, I did sign up for the BFA e-newsletter, and boy am I glad that I did. One day I received a BFA e-newsletter which contained a schedule of their upcoming classes and I paid particular attention to the class entitled, “2017 Handgun Moving and Movers.” After reading the course description, I decided that this would be my very first training class. Although this class was (very accurately) labeled as “NOT a class for beginners” and “not for the novice handgun student,” I felt that I met the prerequisites for the course, as I was very competent in the proper and safe handling of my handgun and by this time I would definitely no longer consider myself a novice. Honestly, my bigger concern was the part that said, “The class will be somewhat physically demanding with lots of time spent moving with a purpose, so please show up expecting to work hard.” I have no problem with working hard but it was the “somewhat physically demanding” part that kinda freaked me out a smidge. I am a middle aged, “fluffy” lady (think a short, Michelin Woman) and not a 20-something aerobics instructor– someone define “somewhat physically demanding” for the panicky almost 50-year old in the front row, please. After putting my fears on the back burner, I sucked it up and took the plunge–I began signing up for the class. As I was filling out my registration, I came to a part that said that BFA members receive a discount on BFA events, which includes training classes. Discount? Did you catch that part earlier where I mentioned that I am financially challenged? Well, anytime I see the word “discount” for something in which I have an interest, I am on that like white on rice. However, I did notice this key word: member. Dang it! I wasn’t a BFA member. Oh, well, I had made up my mind to take this class and a discount is a discount so I figured I’d better see what was involved in becoming a member. I hoped that somewhere there would be a one-week membership for about $5. That would be right up my financial alley! The first 25 minutes of class were spent with our instructors introducing themselves and sharing their credentials and qualifications with the class. To say I was impressed would be a serious understatement. I felt very honored to be about to be taught by such distinguished and skilled men: Military Veterans, Law Enforcement Officers, SWAT Team members and leaders, Antiterrorism Security Team members–I knew I was about to be trained by the best of the best and I was super excited! Andy then went over the safety precautions and protocols that would be observed while we are at the range, and he showed us all of the available safety equipment and emergency staff available in the unfortunate event of an accident. I was pleased and confident knowing that should the unthinkable happen, the staff would be ready to address the situation immediately and aggressively. Andy even explained the importance of accurately communicating our location to the 911 operator so that our call would not be routed to the wrong agency due to our odd whereabouts. The gun I used for class was a Sig Sauer P320 Compact which came with a holster. The Sig Sauer was recommended to me by a Marine friend of mine named Matt who works at Pro Armament in Cuyahoga Falls, OH. Yep, I was stoked, pumped, and rarin’ to go, right up until Andy asked everyone to introduce themselves and tell about the training that they’ve had. I don’t think there was a single person in that class who had had less than 3 years’ experience taking training classes—and that was just classes. Most of these people had been shooting pistols, shotguns, and rifles since they were old enough to hold one. I think a few of them may have had a revolver in the womb…As each person introduced themselves and listed their qualifications and trainings, I felt completely out of my league and that I was a total idiot for thinking I belonged with shooters of this caliber. What on earth was I thinking? I no more belonged here than a canary at a cat show. I was sitting all the way in the back of the class and when it was my turn to speak I introduced myself, gave my profession (I wanted to say former Bond Girl but I figured that wouldn’t fly…), and then very sheepishly announced that I was the official “newbie” of the group as my only training had been my CCW class. Our class took place in a garage with a cement floor and after I made that last statement about my training, you could have heard a pin drop. Actually, you could have heard a #1 sewing needle drop and it would have sounded like a rifle shot. I felt so embarrassed and humiliated and I could feel that sting behind my eyes that you feel when you know the tears are coming and you’re probably not going to be able to stop them, and that’s when Andy looked me straight in the eyes and said, “I’m gonna be watching you,” and then he did that hand motion with two fingers going from his eyes to my direction and I didn’t know what to make of that. Was he going to be watching so he could help me or was he going to be watching so at my first screw up he could boot me outta there since I shouldn’t have been there anyway? 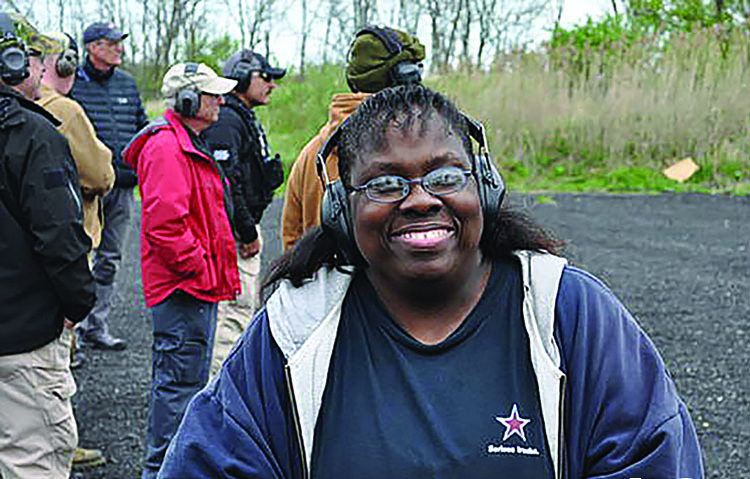 There were four gentlemen after me left to introduce themselves and, as they were doing so, I had made the decision that I had made a terrible mistake coming here and, when the class headed to the range, I was going to sneak back to my car and get out of there as fast as I could. Just as I was getting ready to collect my things so I could bolt, the gentleman sitting next to me said, “Y’know, we all had to start somewhere and we’re all here to do the same thing–to learn, to practice, and to improve our skills. It doesn’t matter what you’ve done or haven’t done. It’s the fact that you’re here and you’re ready and willing to learn. And don’t worry— we’ll help you.” This time the tears did come but for a totally different reason. It must have shown all over my face that I was terrified and this man was so sweet and so kind and he reached out to me, as did the rest of the class and the instructors throughout the entire day. I soon discovered that Andy was “watching me” because he needed to know what I could do and what I was not yet able to do or what I had not yet tried. Even in our large class where personal instruction should have been not an option, whenever I was called to complete an exercise, there was always someone there to help me: Kyle, who was such an amazing instructor and was so encouraging and so patient; Jack, who seemed to be able to whip a blue training pistol out of thin air at any given moment to gently and repeatedly show me ways to improve my grip; Andy, who was such an awesome encourager and instructor that he made me believe I could accomplish anything; Clint, who had to be the coolest and funniest officer I have ever had the pleasure to meet and who was a great class member/trainer, and Joe, who always seemed to be at the right place, at the right time, with the right words to boost my self-esteem and encourage me to keep going. The really cool thing was that the instructors were this way to everybody! You could tell that we were all in this together and everyone wanted everyone to succeed. Ever since I started shooting, I have told my husband that gun people tend to be the best folks and that was definitely proven in this class. Practically every member had something positive to say to me and there was no negativity and no show-boating because we were all there for the same purpose– to learn and to improve our skills. Everyone was excited and impressed when goals were made, and encouraging and reassuring when attempts fell short. There were two awesome ladies in my class who could totally hold their own with all those men, and initially I was intimidated by them because they both were such good marksmen, but I quickly found out that these two ladies were as beautiful on the inside as they were on the outside, and they too were just absolute sweethearts to me and their advice helped me quite a bit. If you take this class, you will move, and you will move like your life depends on it because one day it may. Don’t come to this class tired or having partied the night before because these trainers will make you work and work HARD! These gentlemen know that someday your life may depend on the training received here and they act accordingly. This is not a game and this is not play time, and safety and adherence to the range rules are paramount. These guys don’t mess around and they pull no punches when it comes to keeping everyone safe. Exercises are completed by one student at a time so everyone’s focus is on the person shooting to minimize the potential for any accidents. Did I mention you move in this class? You will shoot drawing from a holster (you must have a holster for this class) and you will move! You will walk and run between cones while shooting, hide behind barrels while engaging an enemy, duck behind fabricated walls while engaging an enemy, shoot at targets while walking forward, shoot and drag while moving backwards, shoot two moving targets—one that is not nearly as large as it is when it is not moving and one that is far too small and becomes even smaller when it’s moving, shoot while walking at the same pace as another shooter, and, my favorite, shoot targets placed in hidden doorways. By the time you have completed this class, you will have a rock solid understanding of the critical importance of moving “off the x” during a shooting situation. If you are interested in taking this class but have had no other training other than your CCW class, it would be prudent for you to take an honest look at how much time you have spent training and working with your gun before registering. Although everyone was extremely kind and helpful, no one was there to hold my hand or pull my trigger (okay, except that one time when Andy pulled my trigger to demonstrate proper trigger control). In other words, if you have not had any other classes before, you really need to have at least put in some serious range time and be confident in your proficiency with your weapon before taking this class. As the course description says, this is not a class for a handgun novice or a beginning shooter. There’s still time to sign up for other BFA 2017 training events! Since I was so green and so excited going into the class and didn’t read the class instructions very well, I didn’t know that I was supposed to have a belt and holster, so I borrowed a gun belt from Jack, one of the class trainers, and I used the holster that came with my Sig, which I had fortunately left in the case. Although I really like the Sig Sauer holster, it is, unfortunately, the paddle type that hooks onto a belt or the top of pants and I prefer a holster with loops that can be used with my gun belt. With paddle holsters (I’ve tried a few), I always feel like the gun could slide off when I lean forward or come off when I go to remove my pistol. The holster I purchased post-class is a Blackhawk! Serpa Concealment Holster. It was recommended to me by my friend Jarrod, who is also a Marine, and who works at Top Shot Firearms in Ravenna, OH. 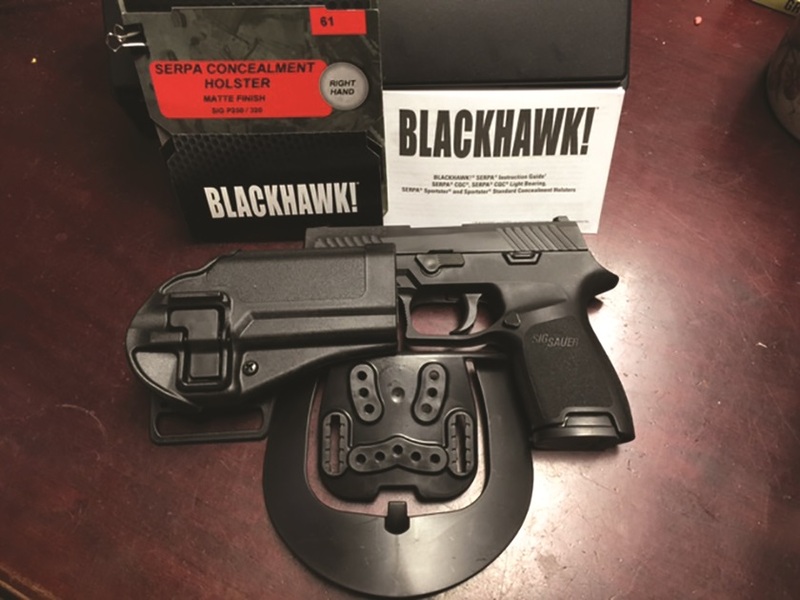 I absolutely love this holster because it has a retention adjustment screw and an auto lock release that prevents my gun from falling out or being unintentionally removed from the holster. Also, after class I purchased a Cobra Tactical gun belt which is amazingly strong and was purchased on recommendation from Matt as well. I tend to weigh heavily the opinions of LEOs and Military personnel for practically everything involved in my shooting because they are the warriors whose lives actually depend on the armaments and tactics that they carry into battle every day, both on the streets of Afghanistan and the streets of American cities. I hope I don’t sound too corny but my respect for these men and women is tremendous.